Approx. 17-inch (42.5cm) wide x 10-inch (25cm) tall x 3/4-inch (1.88cm) thick. 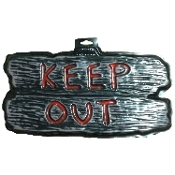 Dimensional creepy detailed look of brown and black fake wood grain, bloody-red words and spooky decorations as in photo.